I found this print as I was going through all the stuff in the basement. Final round 1975. 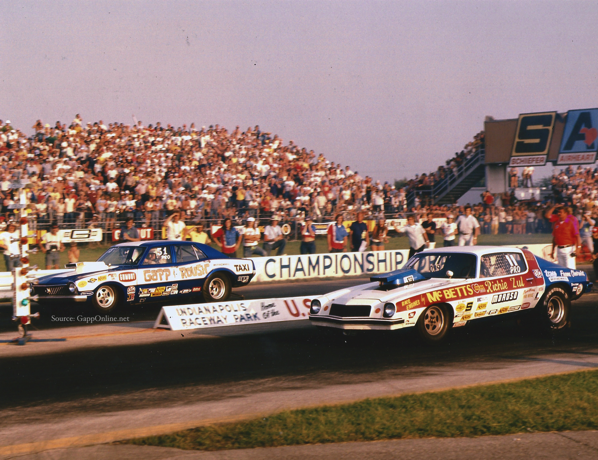 Wayne Gapp – The ‘Taxi’ at U.S. Nationals as a photo of the week. 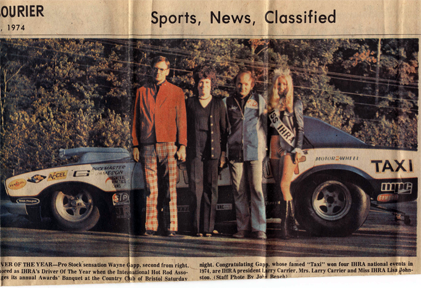 This is a picture of the 1975 U.S. Nationals Pro Stock final round. 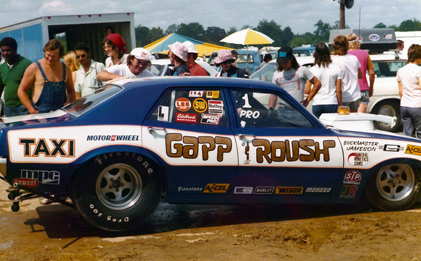 Wayne Gapp vs. Richie Zul. If you dig around on CompetitionPlus.com you can find the video of this race. My last post (see here) was of the ‘Taxi’ at Indianapolis in 1974. That image was taken by Dan Williams. Jack Grice sent me HIS picture from the same race. Almost the same exact position. It was taken either just a few minutes before or just after Dan’s. The crowd has changed out but the guy polishing the car is still at work. In the case of Jack’s picture he is at the front of the car with the rag on the hood scoop.